Article by Baumrind (1991) Journal of Early Adolescence 11(1) p. 56-95. 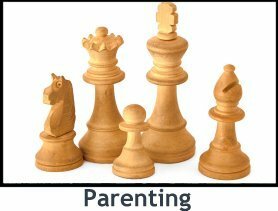 Demandingness or Control: This relates to the parent’s demands on the child to be part of the family, expectations for mature behavior, discipline and supervision, and willingness to confront behavioral problems. Responsiveness or Warmth: This relates to fostering individuality and self-assertion, as well as teaching empathy and respect for others, as well as being responsive to the child’s specific needs and demands. These parents were highly directive, valued obedience, and were more controlling. They showed less warmth and nurturance, and more distance and aloofness. They maintained order, communicated expectations while discouraging discussion and debate with teens, and monitored the children carefully. Their children showed a multitude of problems; they were less individuated, and showed lower internalization of pro-social values, ego development, and performance on cognitive tests. The teens were more likely to see their parents as restrictive. Boys from single authoritarian homes had more problems than their peers from two parent homes. The relationship of the parents also appeared less stable, as 50% were divorced. These parents were flexible but firm. They communicated expectations, but allowed verbal give-and-take to negotiate with older children and teens. They had clear expectations for behavior and conduct, which they monitored, and their discipline fostered responsibility, cooperation, and self-regulation. The parents used more suggestions and positive incentives, as well as fewer commands, physical enforcement, and prohibitions. Their children coped very well; they were judged by others as more individuated, mature, resilient, and emotionally self-regulated. They were achievement oriented, and had the highest scores on tests of cognitive competence. Children from single parent authoritative homes did not differ from their peers from two parent authoritative homes in terms of adjustment. Only 14% of these families were divorced, and so the parents’ relationship may be more stable. This new type of parent included those who appeared Authoritarian, but were not so intrusive and controlling as strictly Authoritative parents. These parents were just as likely to monitor as Authoritative parents, and valued conformity and adherence to the rules of the home. However, while they were less warm than Authoritative parents, they tended to be warm and nurturing upon compliance, more so than Authoritarian parents. Their teens showed no more behavior problems than teens from Authoritative families. While teens from these homes did view their parents as more restrictive, they also showed very low levels of level of drug or alcohol use. I tend to think of this as a cultural variation of Authoritative parenting. Some of the research on African American parenting has shown that these parents appear to be Authoritarian on parenting questionnaires, but their children were not report unhappiness or resentment like those of true Authoritarian parents did. Many have argued this kind of parenting is more common in lower SES neighborhoods; in such communities, parents may be more directive and restrictive regarding their children’s behavior, but do this not with a desire to control their children, but rather with a desire to keep them safe given the dangers in the community. Only 14% of these families were divorced, and so the parents’ relationship may be more stable. These parents made fewer demands, and allowed teens considerable freedom to regulate themselves. The used little discipline, expected little maturity and conventionalism from their children, and avoided confronting signs of problematic teen behavior (especially substance abuse). The children were less assertive, as well as less cognitively competent, though sometimes adults commented that they “smart” but less achievement oriented. They were more likely to show poor emotional regulation, as well as use substances; only children from rejecting and neglecting homes were more likely to use substances. More single parent homes fell in this group than the Authoritative or Authoritarian types. These families were highly unstable, as 86% were divorced. This new type of parent included those who were just as warm as Authoritative and Permissive parents. However, they were more structured through democratic decision making than the Permissive parents, and less controlling and likely to monitor as Authoritative parents. The teens from these families looked much like those from Authoritative families. I tend to think of this as a cultural variation of Authoritative parenting. Some of the research into parenting styles seen in Hispanic and Native American families show that these families make decisions more by a group than by an individual process. Since the larger family accepts responsibility for parenting all its children and is impacted by parenting decisions, it only seems fair the larger family should have a say in the decision making process. Further, if a first intervention does not appear to work, in many cases these kinds of families will try another intervention and have another family member implement it. These families were twice as likely to be divorced as Authoritative and Directive families, as 28% were divorced. However, this is still a low divorce rate compared to the other types of parents. This new group included parents who showed mild levels of both control and warmth. However, they were only 10% of the final sample. The families were as stable as most families, as 39% were divorced. These parents were low on both demandingness and responsiveness; they did not structure, organize, discipline, attend and supervise… and may actively be rejecting or neglectful of the children. The children coped poorly and showed the lowest cognitive scores of all the youth assessed in this study. The children were also more likely to engage in antisocial behavior, to show poor emotional regulation, to show more internalizing and externalizing problems, and to be judged as more immature and rejecting by their parents and teachers. They were the most likely to use drugs and alcohol. More single parent homes fell in this group that the Authoritative or Authoritarian types. Parents in this group sometimes show a heavy-handed effort to discipline, which does not work, followed by giving up and making no effort to discipline at all. Disorganized and substance abusing families fall into this group in high numbers. These families were the most unstable, as 60% were divorced. Interestingly, teens from a combination of low control and mild warmth, or mild control and low warmth were not significantly different from their peers from the Neglecting/Rejecting parents group.